What are the three worst emotions in business? Disagreement, Disappointment, and demotivation. These are all on the “misfit’s wheel of misery.” This is the fourth in a four-part series about how to reset work, and avoid the wheel of misery. Karla Nelson: Welcome to The People Catalysts podcast, Allen Fahden. Karla Nelson: Hello, good sir. How are you today? Allen Fahden: I’m doing great. I can’t believe we’re at it again. Karla Nelson: Oh, I can. This is a really exciting podcast, because it is part four of a four-part series, which we’ve been talking about, the three worst emotions in business. There are three spokes to this wheel that we’ve been referencing in the podcast. The first is disagreement. We’ve talked about the attempt to solve this in corporate America is conflict management, and then disappointment, and the attempt to solve this is called performance management, and what brings us to today, de-motivation. What we’ve tried to solve this in corporate America would be employee engagement. All of these three spokes are part of what we call the misfits wheel of misery. We’ve had to understand that we are all misfits at certain parts of the work that needs to get done, day in and day out. Businesses use the solution of criticizing people for what they’re not instead of focusing on what they are. 99% of people are pushed into their week work, day in and day out, and that is the reason why 89% of people worldwide hate their jobs. Now, I’m not saying dislike, don’t enjoy … Hate, capital H-A-T-E, their jobs, via the most recent Gallup polls, which is absolutely pathetic. We’ve got to fix this problem. Karla Nelson: Well, Allen, obviously, this comes from the person that disliked the motivational posters so much that you, as a shaker, came up with the idea for the original de-motivational poster. The very first one, all you can just think about this, is … It has a beautiful picture of a blue sky, and I’m sure we’ve all seen these on business walls, and underneath it, it says, “Give up. You’re a loser. No motivational poster’s going to change that.” That’s awesome. Allen Fahden: There’s another one that’s de-motivational, based on the people who put these things up. You can imagine that stock photo of the sun rising behind these silhouettes of two people climbing to the peak of the mountain, one helping the other one up, extending a rope to them. It’s just inspiring. Karla Nelson: Gosh, I actually think I actually put that up on one of my walls, early, when I was 22. I think it’s red dirt, isn’t it? Allen Fahden: Yeah, but in order to be de-motivational, yes, the word underneath it is, “Leadership,” then it says underneath, in small print, “You’ll know it’s there when no one puts crap like this on the walls.” Are you feeling de-motivated yet? Actually, you don’t need any posters, because the system is already working 24-7 to de-motivate you. Karla Nelson: Yeah, good point. Allen Fahden: You’ve heard these words, disgruntled and inept. Well, that’s another way of saying angry and dumb. Well, I’d rather be gruntled and ept. That’s happy and smart. Karla Nelson: Well, de-motivation happens every day to millions of people in the workplace. Here, you’re in a meeting, presenting your work or your ideas, and then, literally, just because our inbox doesn’t match our outbox, someone’s going to rip the rug from right under you, not even meaning to. They’re just doing the part of the work that they’re better at. Allen Fahden: Absolutely, it’s natural, but our natural instincts get in the way of each other. If they disagree and don’t like your idea, you’re disgruntled. If they’re disappointed and don’t like you’re work, you’re inept. Karla Nelson: That’s a good point. Yeah, most of us are not angry. We’re not dumb. It’s just that we’ve been miscast. We haven’t been giving the part of the work that we’re best at. I know we’ve mentioned this in a lot of podcasts, but a shaker, people look at shakers and go, “Oh, wow, you’ve got your head in the clouds,” or, “Squirrel,” or, I mean, they look at everything that that person’s not instead of what they are, the same as a mover, “Oh, you always have to be in control, don’t you?” Well, actually, no, they just need to get things done because that’s the part of the work that they do well. Approver, “Oh, you’re Eeyore. You’re a pessimist. Gosh, you’re such a downer,” instead of going, “Wow, this person can identify the challenges ahead, and we need to think about them before we move forward.” A maker, they’re like, “Gosh, makers just got their head down, eating checklists for breakfast,” and oftentimes are looked at as not contributing. Well, they’re contributing, they’re just contributing in a different way than everyone else. Being miscast is a big part of this challenge we have in business, of being de-motivated simply because we’re asked to be somebody that we’re not. Karla Nelson: Yeah, the poor oners. We don’t talk about them too much, because, sorry, guys, you’re one percent of the population. Allen Fahden: But it’s interesting, the one percent of the people are the people for whom 100% of the work is designed. What does this mean? You go to any standard system and you’re going to spend 60 to 80% of your work in your weaknesses. That’s why we all look like misfits. We are not misfits. We are, as you say, miscast. Karla Nelson: Yeah, well, that’s when you get on this whole misfits wheel of misery, which is being miscast, having the disagreements, the disappointments, and then that completely leading to the de-motivation in any part of work. We don’t feel a part of something grander than ourselves, and oftentimes I really think entrepreneurs have this challenge because they think they need to be able to come up with the idea, run with it, figure out what’s going to go wrong, and implement it. Well, that’s kind of a recipe for disaster. Allen Fahden: That’s why my favorite definition of an entrepreneur is someone who wakes up screaming in the middle of the night. Karla Nelson: We’ve got our friend, Ernesto Sirolli to thank for that one, I think. No, who was that that shared that with us? Was it Ernesto? Karla Nelson: Or was it Randy Haykin? Karla Nelson: Yeah, that’s good stuff. Allen Fahden: Beautiful stuff. Well, let’s go right down to the essence of it. What the system says, and these are the common wisdom, “Oh, nice idea. Why don’t you run with it?” or, “You started it, you finish it.” Well, each one of us has … Even some of the smaller tasks have beginning, a middle, an end, and most of that is what puts you to the 60 to 80% your weakness work. We’ve got to divide it up into smaller pieces. Karla Nelson: Yeah, good point. When you think about it, it’s like, if the person was strong enough to have that great idea, they’re probably the weakest one at finishing it or running with it. When you think about that, it’s really hard to stay motivated when the entire system is working against what you’re best at. Allen Fahden: Absolutely. In the initial podcast within the series, we realized that there’s a hidden part of the system that causes us to ride around on the wheel of misery. Karla Nelson: Yeah, the three spokes of this wheel, again, are disagreement, disappointment, and de-motivation. Podcast one, we talked about the whole big picture, but in podcast two, we talked about a meeting, and this is a real, true story, where people are free to disagree with each other’s ideas, so that you can do the part of the work that you’re best at. But unfortunately, that often does more harm than good, and some early adopters tend to get angry and frustrated, and they take any criticism of their idea personally. In podcast three of the series, we talked about a meeting where people present their work to a supervisor, and then the supervisor doesn’t like it. Gosh, seriously, guys, law of diffusion of innovations, people are different. Just understand that aspect of it, and it can really, really help with the de-motivation aspects of each person at each part of the work that needs to get done. Allen Fahden: Right, and when your supervisor doesn’t like your work, that’s when you go away thinking, “I’m not very good at my job. Maybe I’m in trouble.” Well, take heart, it is not people failure. You are good at your job. It’s just you’re being given the wrong work.” It’s not people failure, it’s system failure. The system is bad and needs fixing. Edwards Deming, the great quality guru, found that 94% of failure is not people failure, it’s the system. Karla Nelson: Didn’t he increase that to 97% after he redid that? Allen Fahden: I think so. Karla Nelson: It was even higher than the 94%, after looking at it, because it’s not people, it’s the process we put people through. Allen Fahden: Think about that. If the system is stacked against people getting their ideas and work accepted, why not make a small change to the system? Why not set people up to succeed rather than setting them up to fail, the way the system is doing today? Karla Nelson: Yeah, and focusing on what they’re not good at instead of what they are good at. Karla Nelson: Yay, love that. That kind of reminds me of a story of our good friends Steve and Paul. Allen Fahden: Steve and Paul, this is so perfect. Karla Nelson: It just makes me laugh, because sometimes it’s little things that make the big difference. Everyone thinks it needs to be this big magic wand, and then everything is going to go and be perfect, but oftentimes it’s seriously the little things, and it’s about what people are good at and what they do naturally. You have a quote, or somebody, that you’ve said several times about leaning in the way that the horse is running. Karla Nelson: They basically were cross-trained. They both had to balance, and whoever came up with whichever one, then the person available responded. Allen Fahden: Yeah, so the jobs were exactly alike. Now, were Steve and Paul exactly alike? Well, Steve was bored stiff with server maintenance, and Paul hated help desk. Karla Nelson: Yeah, well, Steve’s a little too logical and a little too simple. However, we looked at the problem and said, “Hey, Steve, who was a shaker, does not like mundane tasks, and doesn’t mind being interrupted. Have him then do all the help desk work, because that’s consistently being interrupted and it’s new.” It’s a new idea that has to evolve to go, “Oh, we can solve it here. We can do this or we can do that,” where, then, Paul was a prover. Paul hates interruption, and he’d be absolutely happy just sitting in the back office, with his door shut, and enjoying just updating the server stuff. Allen Fahden: Yup, and they actually put up a sign. I’m going to creep ahead a little bit here. They put up a sign on Paul’s door, and it had an arrow on it, and it said, “All help desk inquiries go here,” and the arrow pointed at Steve’s office, which is right next door. Karla Nelson: Such a simple little fix. I mean, such a simple little fix, just understanding what part of the work that somebody is good at and they enjoy. I mean, that is a huge part of de-motivation, is just putting and miscasting them into a function, or looking at their resume and thinking, “That’s right who they are,” and then going, “Oh, wait a second.” This is a really good example, because everybody thinks technology or IT … There’s different parts of that aspect of work. Based off of the law of diffusion of innovations and being a mover, shaker, prover, maker, you’re going to be better at different aspects of technology. You just can’t throw everybody into a huge bucket. Allen Fahden: That’s right, divide and conquer. Take the work you’re doing, even some of the smallest tasks have big percentages of shaker, mover, prover, maker in them, and three of these might be wrong for you or two of them might be wrong for you. Why are you doing them? Karla Nelson: Yup. Well, look at this, Steve, being a shaker, he was absolutely horrible at server maintenance. Why? Because he didn’t want to be in the back room. Conversely, Paul, he was a prover. He couldn’t stand the help desk, and he was horrible at it, even though they’re completely in a technology realm. Allen Fahden: And this is something to think about, is that, if you hate something, are you faster at it or slower at it? Allen Fahden: Slower, much slower. Allen Fahden: Now, you’ll know who to give it to, because they love it. You’re not trudging through all your weak work, which slows you down and ruins your whole day, and then you’re stuck spending your whole day on it because you’re so slow and you can’t focus. Happier, faster, and better. Guess what happened to their performance? They achieved more, naturally. How’s that for performance management? You want to do performance management, give people the things they can already perform on. Divide up the work, find their strengths, give them what they can perform on. Karla Nelson: No kidding. Give people what they’re good at? Allen Fahden: What a concept. Karla Nelson: It literally is so simple, but honestly that is not what we typically do. We focus on, “Where’d you get your B?” Not all your As. Let’s focus on the B versus the things that are naturally easy for you and you can achieve. The greatest part about this is I’m going to go back to another buzz word or turd word, like we like to call them, which is, when you think about conflict management, performance management, so much that has to do with the culture in business, you can remove 75%, maybe even 80, of the rub, because Steve and Paul actually got along after this. I mean, they even started to like each other. They’re shakers and provers, so there’s always going to be a difference of perspective in that regard, but so much of what we focus on in regards to culture, it’s not the ping-pong table. It’s not the potluck on Friday. Just allow people to do the part of the work and shine a light on what they’re great at, and then they magically will enjoy each other’s company, because they can appreciate the other person’s work. Allen Fahden: Oh, my God. When somebody says, “Hey, I know you hate that part of the work, and I’m really good at it. Let me just take that, and you don’t even have to worry about it,” I say, “God, I’m going to rotate your tires for that. I’ll come clean your bathroom, anything. I am so grateful to you.” How can you not like somebody who does that for you? Karla Nelson: The stuff that you just don’t enjoy doing. Allen Fahden: Yup, because they enjoy it. Karla Nelson: Exactly. Now, remember, there’s only one percent of the population that are oners, so everyone else is better at a piece of the work, and when we’re asked to do the part of the work we don’t like, that’s truly that spoke of de-motivation. Disagreement, we talked about, disappointment, and now de-motivation. A huge part of that de-motivation is just being asked to do something you really don’t enjoy. Allen Fahden: Yeah, and if you have the opportunity to become happier, faster, and better in your work, how does that compare to a motivational poster? What if, right now, you have people that can be happier, faster, and better? Karla Nelson: Yeah, and you can be happier, faster, and better, so it’s really important that we lean on each other and we lean into every one of our strengths. Gosh, Ernesto Sirolli has a great … Now, we’ve quoted him twice. What’s his quote on … The death of an entrepreneur is solitude. Allen Fahden: Solitude is the death of the entrepreneur. Karla Nelson: Yeah, that’s a big part of it, because we think we have to go at it alone. The truth of the matter is, if you’re missing one of these core natures of work on your team, that’s bad. If you’re missing two, it’s a disaster. It’s super important that you’re leaning into what people are good at. Who doesn’t want to be happier, faster, and better? I like all those lines. That’s a good one, Allen. Allen Fahden: Anybody who doesn’t want to be happier, faster, and better, okay, well, you just keep doing what you’re doing, bless you. Karla Nelson: That’s awesome. Wonderful. Any last words that you’d like, as we wrap up part four of a four-part series, which we talked about the three worst emotions in business and the misfits wheel of misery? 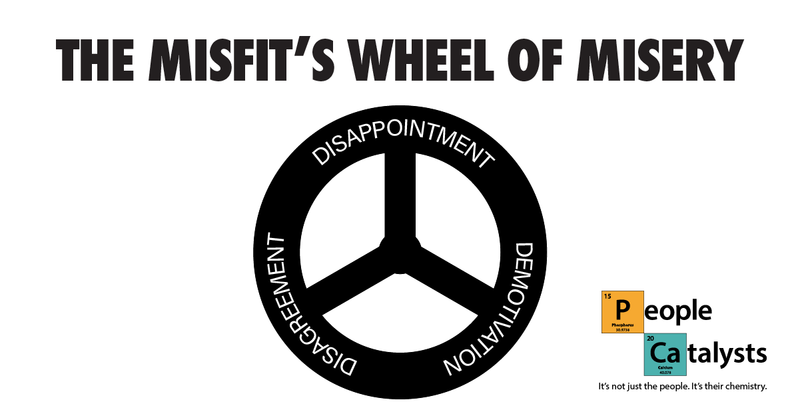 Allen Fahden: I hope that the misfits wheel of misery now has a flat tire. Karla Nelson: Yes, big fat flat tire, because, of course, we want to be happier, faster, and better.